"Optimal Thinking has a little bit for everyone and will help people to be the best self they can be." 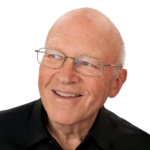 Click below to learn why Optimal Thinking resources are replacing the “think positive” products that have been with us for decades. Listen to the 100-Day Optimal Thinking audio program, take specific Optimal action steps on a daily basis and make it your habit to optimize — not just manage or improve — your personal and professional life. Discover how to ask the best questions, obtain the best solutions, and make the most constructive decisions in every circumstance. Learn how to consistently be your best, make the most of every situation, maximize your emotional and financial intelligence, bring out the best in others, and achieve the best results. Enjoy this multi-sensory Optimal learning experience, and achieve lasting success! This 50-question Assessment uncovers your dominant thinking style, your other thinking styles, and how much of your thinking is in your best interest. It empowers you to be optimally effective at work, at home, and in all your relationships. You will receive a personalized 21-page Self-Optimization Report. If you invite others to give you feedback, you will obtain a 360° (multi-rater) view of yourself. You can read your personalized 41-page Composite Report online or download and print it out at your convenience. Listen to the Optimal Thinking audio program, take Optimal action steps on a daily basis and make it your habit to optimize — not just manage or improve — your personal and professional life. Discover how to ask the best questions, obtain the best solutions, and make the most constructive decisions in every circumstance. Learn how to consistently be your best, make the most of every situation, maximize your emotional and financial intelligence, bring out the best in others, and achieve lasting success. Our customized assessments are used by thousands of universities, government organizations, public and private companies. 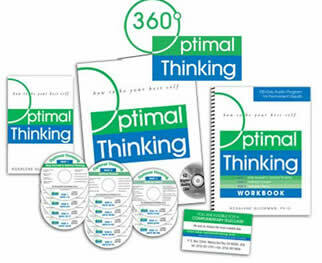 More than 6500 companies have used the Optimal Thinking 360 Assessment to optimize thinking, culture, communications, productivity, and value growth. Optimal visualization enables you to convey to your subconscious mind exactly what you want by using the best pictures and symbols and all of your senses. By giving yourself the Optimal preview, the desired result becomes real and concrete and you prepare yourself to experience the best. This visualization audio empowers you to optimize your personal life and career. In this audio program, you learn how to make peace with turbulent feelings, understand the messages they signal, and then learn how to resolve them with Optimal Thinking. When you implement this Optimal road map, you will minimize your emotional downtime and maximize your up time. Fear is nature’s way of protecting you from real and current danger. It prepares you to escape from harm. Anxiety is the fear of future or the remembrance of past hurt, danger, or loss. In this audio program, you will take the wisest steps to overcome anxiety. When you ask the best questions of yourself and others, you invite the best answers. You can discover what “the best” means in whatever context you choose. You can even create the best path to your most desired outcomes. Are you asking questions like: “Do I want to work 60 hours a week? Do I want to allocate more time for my family and friends? How do I want to change my career? Receive insight and specific strategies to maximize your skills and confidence during your career transition. Prepare yourself to consistently be your best by listening to this audio program every day. 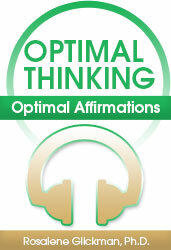 You will integrate each Optimal affirmation at a pace that works best for you. Rise above positive affirmations. Optimize your personal and professional growth. Dr. Rosalene Glickman’s best-selling book, Optimal Thinking: How to Be Your Best Self (John Wiley & Sons, ISBN: 0471414646, 256 pages, seven printings and in 17 languages) endorsed by Stephen Covey, Ken Blanchard, Edward De Bono, Brian Tracy, Mark Victor Hansen and others, autographed by the author, can be obtained through this website. Dutch, Italian, Chinese, Polish, Turkish, Romanian, Australian, Japanese, Russian. Spanish, Korean, Indian (English),Taiwanese, Bulgarian, Egyptian, Slovenian, and Indonesian translations of Optimal Thinking are also available. These 14 2″ x 3″ wallet cards contain Optimal Thinking road maps to understand and best resolve your disturbing feelings. Keep them handy and refer to them when you experience emotional turbulence. Receive road maps for unmanageable feelings, manageable feelings, forgiveness, helplessness, discomfort, anxiety, hurt, anger, disappointment, guilt, depression, grief, envy, and loneliness.